In the 1930s, the Nazis knew that the next war would be far more mechanized than the last one. They encouraged the FIM to create an ISDT Trophy for the top military team. 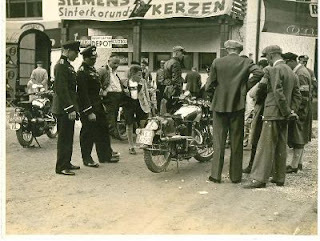 The 1939 International Six Days Trial was held in Nazi-controlled Austria. 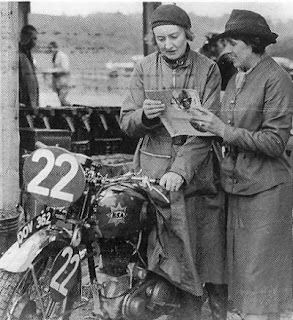 With the political situation worsening by the moment, it seemed that Britain’s teams - especially the military dispatch riders competing for the Huhnlein Trophy - were destined to become P.O.W.s before the first shots were even fired. Instead, they climbed on their BSAs, Matchlesses, and Nortons, and rode around the clock to reach safety in neutral Switzerland. Finally, after another marathon ride, they arrived home just as war erupted across Europe. Adolf Hitler was born in Austria, and remained an Austrian citizen until 1925. If anything, his National Socialist German Workers’ Party–the Nazis–were even more popular there than in Germany. In March 1938, Hitler’s ‘Anschluss,’ made his old homeland part of the Third Reich. A few days later in Vienna, he was given a hero’s welcome. Indeed, though Austria was to account for only 8% of the Reich's population, Austrians would soon make up 14% of the SS, and over 40% of the personnel involved in genocide. 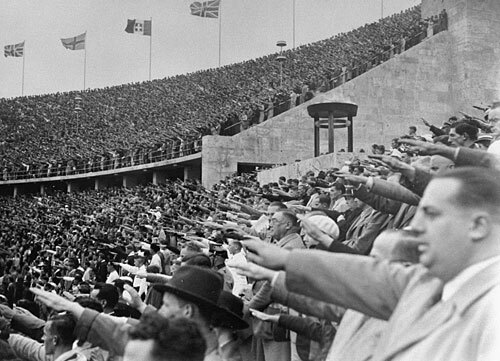 The Nazis were masters of turning international sporting events into propaganda opportunities. The '36 Olympics were the most famous instance, but they also co-opted and encouraged BMW's land-speed-record attempts, and took advantage of the 1939 International Six Day Trial. While Hitler consolidated his power, Britain (and the United States) responded to his political bullying and ominous military buildup with a mixture of appeasement, and their own half-hearted rearmament. Military strategists on both sides realized that the next war would be far more mechanized than the previous one. Motorcycles would play a small but significant role in modern warfare. The British Army realized that the ISDT was an excellent test of military motorcyclists’ combat readiness. So, in 1938, the Army entered a team in the Six Days (that year, the event was held in Wales.) Three soldiers from the Royal Tank Corps; Fred Rist, Paddy Doyle, and Jackie Wood, did well. But overall, the Army team was poorly prepared, and their performance proved that military riders, machine specifications, and preparation had fallen far behind their civilian counterparts. Shortly after the Army riders’ embarrassment in Wales, Britain suffered a more severe humiliation. The British Prime Minister flew to Munich, planning to mediate Hitler’s claim to the Sudetenland (an ethnic-German area in Czechoslovakia.) Chamberlain returned to England, and crowed that he’d “established some degree of personal influence over Herr Hitler.” This news delighted Britons, who were still recovering from the last war. But in fact, their Prime Minister had been completely bullied by the Fuerher, and had thrown Czechoslovakia to the wolves. Through the first half of 1939, the British Parliament reassured the population that war was unlikely, but their actions belied their words. They published evacuation plans in the London newspapers, and dug trenches in public parks, for use in air raids. The motorcycle press was no less contradictory. In early July, Graham Walker (the influential editor of ‘Motor Cycling’) wrote about the coming I.S.D.T., “No thinking person can ignore the gravity of the present situation, nor the oft-repeated suggestion that August may be a month of crisis.” But, he went on, “The Germans and Italians did not question their safety when visiting the Isle of Man in June and we see no reason why we should query the safety of our visiting Germany in August.” Besides, the Auto-cycle Union (A.-C.U.) had been assured by the event’s ‘Oberfuhrer,’ that if war broke out, all competitors would be given safe passage to their borders. After their rude awakening at the ’38 I.S.D.T., the Army vowed to redeem themselves. Dispatch riders were encouraged to enter civilian competitions. They were allowed to use their issue machines, and provided with free fuel and oil. Rist, the Tank Corps Sergeant, took advantage of this ‘sponsorship’ to win the Travers Trophy Trial, an achievement made more noteworthy by the fact that he was still virtually a novice. Later, he teamed up with his fellow corpsmen, Doyle and Wood, to win the team event at the Cotswold Cup Trials. By beating several high-profile manufacturers’ teams, the trio established themselves as the cream of Army riders. In June, the Army assembled a dozen crack riders under the command of Colonel C.V. Bennett. They were to spend the summer at Aldershot (an English military base) in full-time preparation for the Six Days. Their goal was nothing less than to win the Huhnlein Trophy, which was the award presented to the top military team. Over 11 weeks, the soldiers would train and be tested, then three squads of three riders would be selected to go to Salzburg. The rear shocks on these bikes identify them as post-war Goldies, but this gives you a sense of what the bikes (and guys) in this story looked like. Bennett leaned on the manufacturers of the Army’s motorcycles (BSA, Norton, and Matchless) for support. Each firm agreed to prepare works machines for the trial, and provide a factory service representative. The team’s daily routine at Aldershot began with calisthenics and swimming, led by Sgt. Rist. Then there was riding practice on sand, grass, and gravel. They were tested on everything from changing tires and cables to assembling carburetors and clutches. Daily ‘trials’ of up to 200 miles often lasted until late in the afternoon. In the evening, each rider returned to his quarters with his machine, where he performed his own maintenance. Bikes were presented for inspection at 8:30 a.m. the next morning, and the cycle began again. Factory experts gave workshops on set-up and service, and a technician from Dunlop taught them the fastest way to change a tire. In July, the Army lads were invited to the Bagshot Heath scrambles track, where they watched a special committee of the A.-C.U. select elite civilian riders for the British Trophy and Vase teams. The Army brought in the country’s top scrambles riders as visiting coaches. They booked Brooklands and Donington for high-speed practice. Bennett was taking his job seriously; at the end of the month, the ‘International’ team was inspected by Major-General H.R.S. Massy, no less than the Director of Military Training. The Matchlesses and the Nortons were standard-issue models, which were to see plenty of service in WWII. The Matchless G3 was a 350 c.c. overhead valve single, with a four-speed transmission. It made about 16 horsepower, and weighed 328 pounds. The Norton 16H was slightly less up to date, making just 14 horsepower from 490 c.c. It weighed 388 pounds in standard trim. The Matchless was fitted with a modern, oil-damped telescopic fork, but the Norton still relied on a girder fork, with a friction damper. The British Army used two BSA models, the 350 c.c. B25 and the 500 c.c. M20. The M20 was heavy; its side-valve motor was wide. All in all, it was hardly a bike you’d recruit for a serious trial (though some were fitted with 21-inch front wheels, and used in competition.) Not leaving anything to chance, BSA equipped the ‘International’ team with their newest Gold Stars. Most of the British arrived a few days early. Salzburg’s streets were decked with Nazi regalia–decoration for the music festival, and because Hitler himself had established a summer base 15 minutes away at Berchtesgaden. One night at the opera, the crowd’s opera glasses spent as much time trained on one of the balconies, as they did towards the stage; Herr Hitler was in the house. There were so many uniforms in evidence at the Six Days’ check-in–both amongst the competitors and the organizers–that some of the civilian riders grumbled they almost felt out of place. General Huhnlein (of Huhnlein Trophy fame) was present at the start on the first day (Monday, August 21.) Riders took off on a 295-kilometer loop into what had, only the previous summer, been the free country of Czechoslovakia. The first day of the 1939 ISDT sent riders out on a route that was relatively easy, but it still took its toll on the Army teams. Berry (Norton) came off after hitting a dog. The crash destroyed his twist-grip, but he continued, pulling the bare cable to control his throttle. Later that day Smith (Matchless) was blinded by the dust of a passing rider, and hit a bus! He continued with bent forks. Finally, Lieut. Riley’s Norton split its gas tank. The Army’s BSA team of Rist, Doyle, and Wood, however, lost no marks, and was going strong. Tuesday’s loop was shorter, but sharper. A number of competitors retired, including two of the Army’s Norton riders, and one from the Matchless squad. On the Nortons, Berry gave up when his replacement twistgrip would not work. Riley had managed to seal his cracked fuel tank with soap(!) earlier, but the split worsened. Smith, on the Matchless, finally succumbed to the bent forks and wheel he’d suffered in his previous collision. On the same day, the Reich concluded a treaty with the Soviets. German riders and officials reacted warmly to this news. They believed their own propaganda, which suggested that the treaty reduced the risk of war with Poland. In fact, the opposite was true. One of the treaty’s secret clauses gave eastern Poland to Russia. Hitler no longer needed to fear that his attack on Poland would anger the Russians, who also craved Polish territory. This was what the dictator had been waiting for. 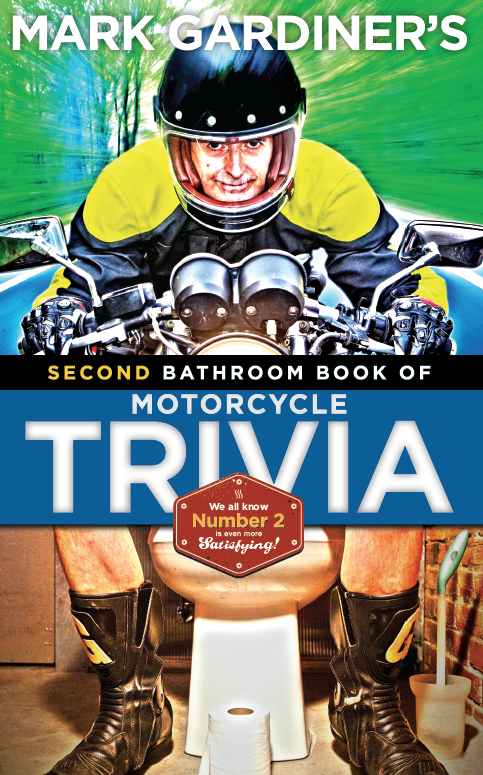 He convened a meeting of his top generals at his summer headquarters - they must have almost been able to hear the roar of trials motorcycles in the clear mountain air - and told them his decision to invade Poland was now “irrevocable.” They were instructed to have their forces ready to move by the weekend. 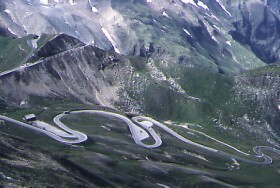 The Grossglockner Pass is still one of the motorcycle roads in Europe. In the 1939 ISDT, competitors raced over this route. Note that the road was not closed for the racers' use. Wednesday’s route took competitors over the Grossglockner pass, a 23-kilometer climb that included numerous hairpin turns. Even at the end of summer, the surrounding peaks were snow-capped. A late thunderstorm put down the dust, and seemed to favor the British riders. That evening, competitors crowded around radios listening to the BBC news broadcast; they heard that France had ordered its citizens to leave Germany within 24 hours. Several racers suggested the British contingent should do as much, but the team managers were against the idea, especially as there were British teams poised to win all the important trophies. The British civilians were heartened by the fact that their Army team seemed perfectly calm. On Thursday, British competitors again took to the course, while team managers sent telegram after telegram, desperate for any information or advice. Their uncertainty lasted into the night, until Norton Motors wired instructions that their team was to withdraw and return right away. Moments later, the British Consul General in Berlin warned all British subjects to leave Germany immediately. By 7:30 a.m on Friday morning, all but a handful of the British civilian competitors had left Salzburg, headed for Switzerland. The German organizers begged them not to go. Event officials, all Nazis themselves, promised the team managers that if trouble started, they would accompany them to the border themselves to ensure a safe passage. Marjorie Cottle was the only civilian competitor who stayed behind when all the other British civilians were told to leave Germany after the fourth day of competition. Her attitude seems to have been, "If the Army boys will stay, I'll stay." In my screenplay, I gave her an ulterior motive... (cue fanfare from James Bond theme, by composer Monty Norman.) Cottle doesn't actually need to be over-dramatized; she was one of the best and toughest female racers of all time, and competed in ISDT events in three different decades. The British military team stayed behind, however. Colonel Bennett considered it their duty to compete unless he received specific orders to the contrary. At 5 a.m., while the civilians were frantically packing and loading their machines, the Army’s lads withdrew their bikes from the enclosure, and headed off according to schedule. One exception was Dalby, the final Norton runner, whose gas tank had also begun to split. Col. Bennett didn’t want to risk one of his men being stranded alone in the countryside, so Dalby was withdrawn from competition. Things seemed calm enough, and after seeing his riders off, Bennett and Bert Perrigo (who was tagging along as BSA’s technical representative) went for a swim. When they returned to their hotel, they found orders from the War Office instructing the team to leave for Switzerland immediately. Ironically, the orders had been issued Thursday, before the civilians had been told to leave, but the paperwork had mysteriously been delayed in transit! While they must have had their doubts about the political situation, the BSA squad under Rist’s leadership were still in the running for the top military trophy; in fact, they had not lost a single point between them in five grueling days. On paper, the sixth and final day - Saturday - was to be the easiest by far. 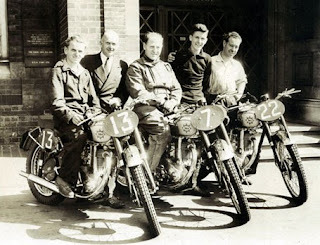 It began with an easy dash up and down the autobahn, and concluded with one last ‘special test.’ Perrigo, BSA’s factory man, suspected that Nazi officials had smoothed the final scrambles course as much as possible in order to suit the German motorcycles, which were fast but heavy. In spite of this, he was sure the Huhnlein Trophy was within their grasp. He noted the similarity between the final test and the team’s practice tracks at Aldershot and Bagshot Heath. Perrigo’s optimism was probably well founded. (Rist became a legendary sandtrack racer after the war; so he, for one, would have done well on the smooth, gravel track.) This much is certain: the symbolism of a team of British soldiers, accepting their accolades from a German general at such a moment in history, would be lost on no one. The British ‘Internationals’ were far from the only soldiers on the move. The German invasion of Poland was set for 4:30 a.m. the next morning. Well over a million German troops began moving towards the border under cover of darkness. Fuel was tightly rationed, but Herr Jaeger, of Shell’s Munich office, provided the group with enough precious gasoline to get to Switzerland. The British contingent - their day had begun so long ago, at 4 a.m. - rode right through the night. Streaming past in the opposite direction, an endless military convoy, headed for Poland. Once, the motorcyclists were halted and questioned by German soldiers at length, until Grimm came to the rescue. It was pouring rain, and cold. Despite this discomfort, they were so utterly exhausted that more than one rider dozed off, waking with a start after hitting the curbs. It’s a moot point anyway because that night, Hitler had a rare crisis of confidence. First, Britain reaffirmed its commitment to come to Poland’s aid. Then, Mussolini screwed up his nerve and informed Hitler that Italy’s military was not yet ready to help if Britain (or France, for that matter) joined the fray. The Fuerher called off the invasion. 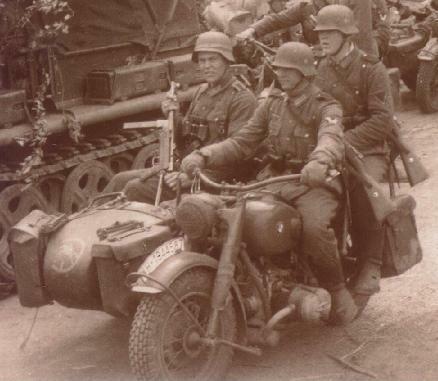 Poland got a brief reprieve, although it took hours for new orders to reach all the men in the field, and the escaping motorcyclists noticed no reversal of the Germans’ mobilization. So, on the morning of the sixth day, instead of charging off to capture the Huhnlein Trophy, the Army team crossed into Switzerland. After seeing the last of his men to safety, Colonel Bennett bade farewell to Col. Grimm, and stepped across the border himself. It would be a long time before an officer of the British Army would again shake hands, as a friend, with of an officer of the Wehrmacht. The British contingent rode almost nonstop through Switzerland and across northern France, to the ferry docks at Calais. They were no sooner home than the war was on for real. England declared war on Germany on September 3, 1939. The United States entered the war two years, three months, and eight days later. Left to compete in their event virtually alone, the Germans won all the major ISDT trophies. The results were never ratified by the FIM. 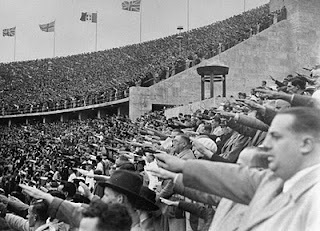 The civilian competitors at the '39 event were taken aback by the predominance of Nazi uniforms. The event was actually organized by the Nazi party, and there was as much interest in the Huhnlein Trophy as there was in the 'main event.' For a few beautiful pictures that set the scene, go to the speedtracktales website. It's great. here are another pictures from the '39 ISDT. My father Captain RCK Money RE was one of the British riders, although not on the army team. His colonel had refused him permission to go, so he took leave and went anyway. I believe thathe was riding a BSA suplied by the factory, a Gold Star that had been used for a round britain promotional ride. My father is deceased now, but he certainly had photographs taken during the event. you might be interested to know the speedtracktales site can now be found at http://speedtracktales.wordpress.com I would also eb very pleased if Dorbel can confirm if he still has any of those photos and if so could Speedtracktales have use of them as part of the history of 1939.